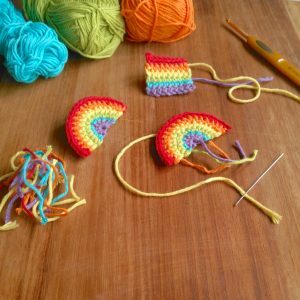 They are very pleasing to make, too – not only do they turn my work table into a very bright and jolly place to be, but it’s very relaxing to crochet something requiring no pattern and no counting for once! 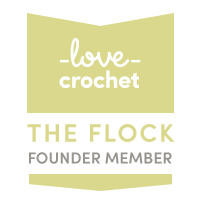 The yarn in these is about 50% organic, the remainder being bamboo and/or cotton, due to dire lack of organic cotton available in the UK. The cards themselves are 100% recycled as always. So you can now purchase these rainbow brooch cards in my Little Conkers Etsy shop, or just drop me an e-mail. The cards will also be appearing in Louise Goodchild’s Rainbow Market this Sunday 24th April. It’s an online market, but if you’ve never ‘attended’ one of those before, it’s as easy as browsing an album of pictures on Facebook and commenting on an item if you’re interested in buying. Louise, I and the other sellers will be around to answer any questions you have, and to whet your appetite, here’s a gorgeous rainbow bracelet by Louise herself which will also be available in the market. Since I’m talking about greetings cards, now also seems like a good time to mention the Just A Card campaign which I really hope you’ll take a look at. The campaign aims to encourage people to support independent shops, galleries and designer/makers. Little, everyday purchases like greetings cards are so important to indie businesses like mine. The big investment purchases are great, but you can really help independent shops and designer/makers by making your small purchases with them too. Do support this excellent campaign by sharing with all your friends!